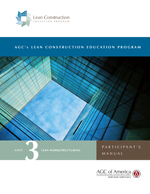 Lean Construction is driven to minimize costs and maximize value on each project completed, challenging all stakeholders to develop and apply better ways to manage the overall construction process. Everyone related to the construction process has incentive to get the project done faster and at a lower cost — from the project owners who want to see tangible results for their investment to designers and contractors who want to do their job well and move on to the next project. To gain credit for participation in this course it must be facilitated in-seat by an approved instructor. Visit www.agc.org/LCEP for more information.